Diet in the wild: frogs, rodents, insects, bulbs, seeds, and berries. While on migration, they also eat waste grain and field animals. Legs are black and body is covered with gray feathers. Head has bald red forehead, white cheeks and pointy black bill. 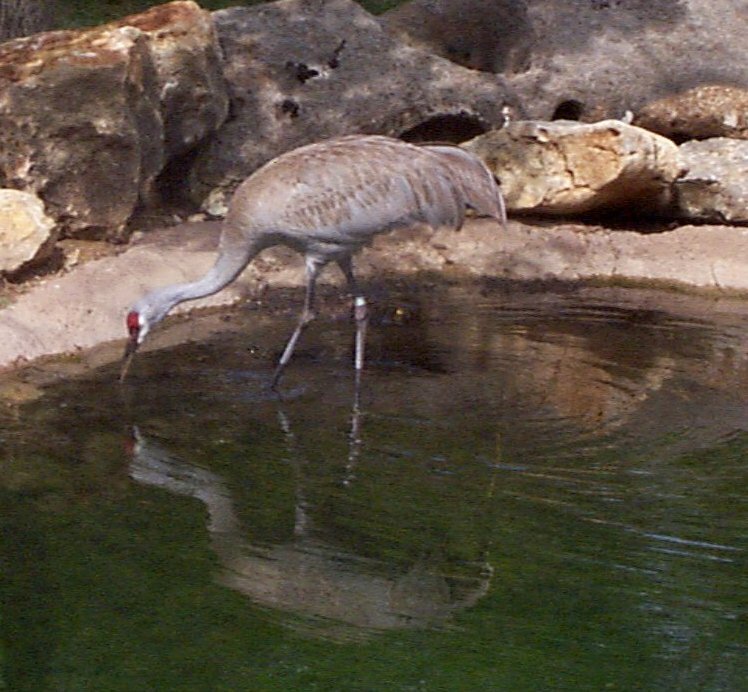 The sandhill cranes travel as much as 350 miles per day while migrating. They fly at anywhere from 14 to 51 miles per hour in a V formation--often as high as 12,000 feet. Their nesting grounds are through the northern United States and extreme northeast Siberia, and they arrive in early to mid May. Nests in the wetland areas are made from dominant vegetation, while the nests in drier areas are sparsely prepared. 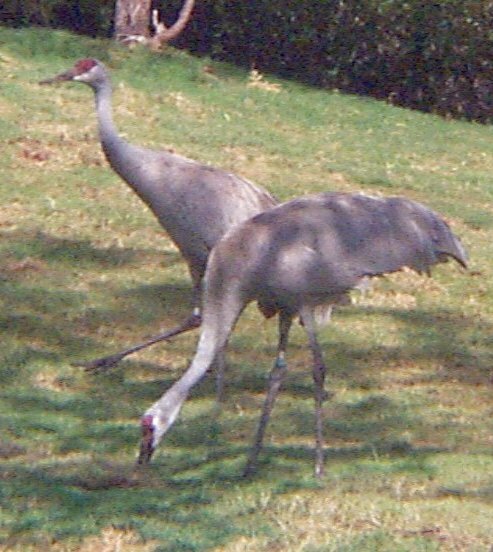 These cranes usually begin breeding at 7 years old and mate with only one partner for life. Two eggs are laid and both sexes incubate. These eggs hatch in 29-32 days, and the nestlings can walk immediately. This trait is why the young cranes are called colts. 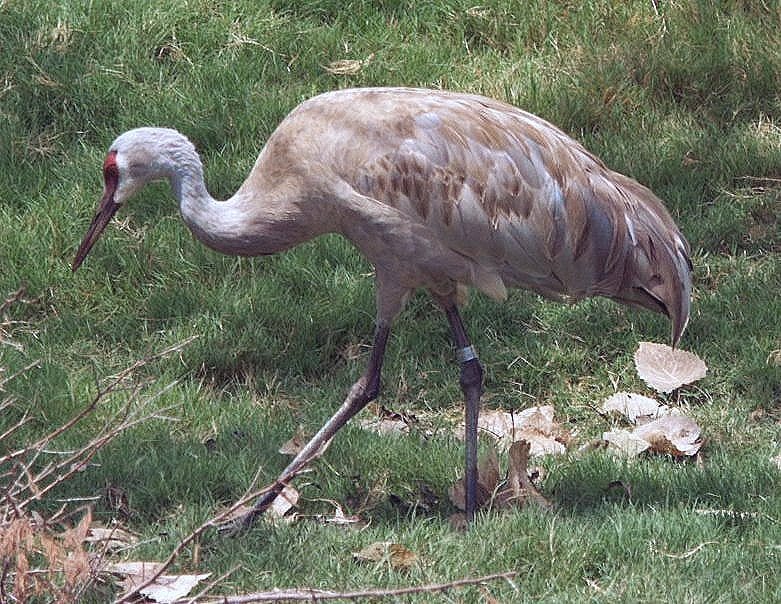 The sandhill crane has a trumpet-like call so loud it can be heard for over a mile. This is because the trachea loops once in the sternum instead of going directly to the lungs like most birds. These crane also preen themselves with mud, vegetation and insects to take on a more reddish brown color. This helps camouflage the young, which are rusty colored and have no red patch because the bald spot is covered with the same down over the rest of their body. The red patch on the adult changes with stimulation. The more stressed the bird is, the more intense the red patch becomes. In the spring, cranes are very territorial to protect their nests. However, they become more social beginning in August to get ready to migrate for the winter. 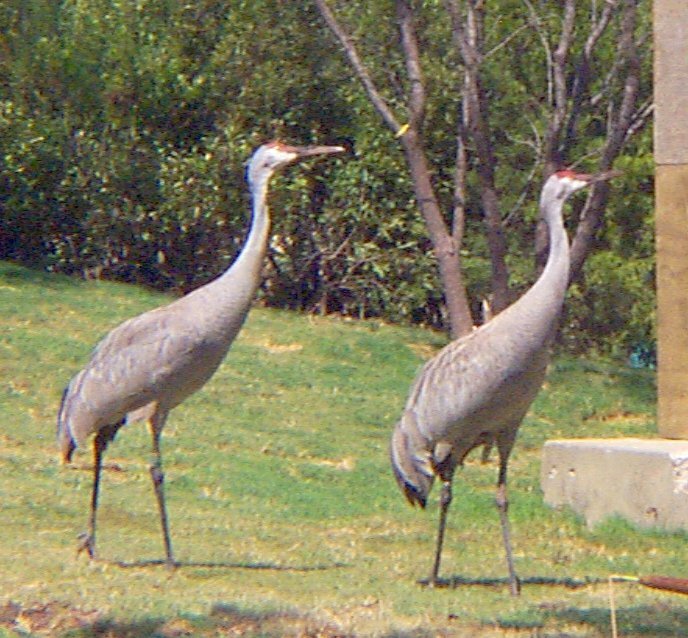 When the cranes walk, their heads bob back and forth like a chicken. They seem a little skittish. They take very tentative steps and jump at noises. However, this could be the cranes getting used to their new environment. Random Bit of Trivia: Big Bird from Sesame Street is a crane chick, or crane colt. 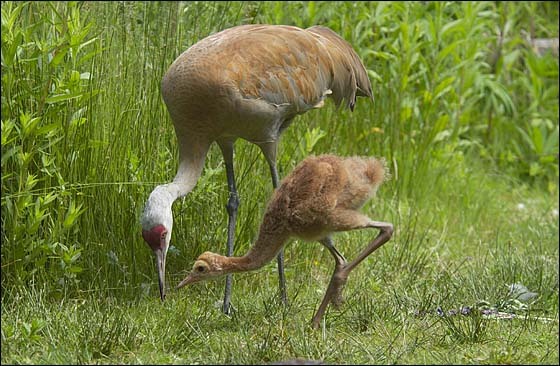 Young cranes can capture their own food at an early age, but they are frequently fed by the parents. In 67-75 days, the colts have fledged and can make the migration south. Usually, only one of the colts survives long enough to fledge. The sandhill parents raise their young for 10 months.